I've heard good things about Windows 7, and I want to upgrade my XP system as soon as I can. What's the best way to move from Windows XP to Windows 7? Let's start with Option 3, just to get it out of the way. You wouldn't really buy Vista to keep for only a couple of hours, would you? Also, putting your operating system through the rigors of two major upgrades greatly increases the risk of an inoperating system. There's one exception I'll make, and here's the scenario: If formatting your hard drive would cause you to lose files or software that's not replaceable, and you already have a copy of Vista laying around, and you're willing to risk the fallout, then doing a "double upgrade" might possibly make sense. But don't tell anyone that I recommend that. Avoid the waxy buildup, install a fresh copy of Windows 7 on a newly-formatted drive, and you'll avoid a gigabyte of trouble in the long run. Now, let's move on to the two sane options above. Reformatting is a big deal. In Latin, it's tabula rasa. In English, that means EVERYTHING on your hard drive will be erased -- all your documents, music, photos, software, and the operating system will be gone. So before you reformat your Windows XP drive, you may wish to save applications, user data, and customized settings to be re-installed under Windows 7 later. The Migration Wizard (a.k.a. Windows Easy Transfer) is a utility on the Windows 7 installation DVD that will help you do that. Navigate the Windows 7 DVD folder tree to the \support\migwiz folder and run the migsetup.exe program. It will scan your Windows XP installation drive for things that can be migrated and show you a list of them. You can de-select things you don't want to migrate, and add things that you may be storing on other drives. When you are ready, the wizard will compress and store all the selected things in one file on a drive of your choice. Obviously, you should choose a drive other than the one to which you plan to install Windows 7. An external hard drive, flash drive or writable DVD would do the trick. If you bought a "full" version of Windows 7, it's OK to format the drive first. But if you got an "upgrade" version of Windows 7, Windows XP must be running when Windows 7 is installed or product activation will fail. So do not format your hard drive before starting to install Windows 7. Insert the Windows 7 DVD, start Setup, and when it asks if you want to format the target drive say "yes". The "Quick Format" option is much faster than a full format and adequate. Setup will erase everything on the target drive before installing Windows 7, ensuring the cleanest, most glitch-free installation possible. Now re-install all the things you saved with Migration Wizard, and you're up and running with Windows 7. You may want to keep your existing Windows XP installation just as it is. Some Windows XP applications will not run under Windows 7. If you have plenty of disk space, you can divide your hard drive into two partitions and install Windows 7 on one of them while keeping the Windows XP installation intact on the other. Then, when you boot up or restart the PC, you can choose which version of Windows to run. That's what I did on my laptop when I installed the test version of Windows 7. You will need to create a new partition on your hard drive, and perhaps resize the existing partition to make room for the new one. Terabyte Unlimited's Bootit NG utility makes this a breeze, and you can use it for 30 days free of charge. See my related article Changing Disk Partitions for some other tips and options to help you partition your drive. Once your new partition is created, insert the Windows 7 DVD and run Setup. Select the new partition for installation. Restart the PC after Windows 7 is installed and you will be given the option to start Windows XP or Windows 7. This option will appear whenever you restart or power up the PC. Note that if you boot up your computer with Windows 7, you're not prevented from accessing the files on the XP partition. You can simply point your program to the appropriate drive and folder to access files you need. On my laptop, I already had a D: drive (for the factory restore image) and the CDROM was tagged as the E: drive. So my Windows 7 files appear as the F: drive when I'm running Windows XP. If I boot up Windows 7, the XP files are on the C: drive. 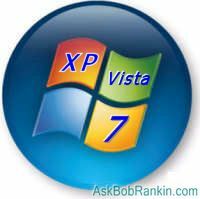 Most recent comments on "Upgrade From Windows XP to Windows 7"
If I upgrade to Windows 7 from Vista, will all of my Office 2007 Excel documents (with macros) still work if I send them to friends using Vista? EDITOR'S NOTE: I don't see why not. Nothing in Office/Excel will change when you move to W7. Can Windows Vista be updated to Windows 7? In 1st paragraph you say: "...you can't directly upgrade an existing Windows XP installation to Windows 7....they are not providing an "in-place" upgrade option for the millions of XP customers who have decided to skip Vista." But then under Option 1 para 3 you say: "If you bought a "full" version of Windows 7, it's OK to format the drive first. But if you got an "upgrade" version of Windows 7, Windows XP must be running when Windows 7 is installed or product activation will fail. So do not format your hard drive before starting to install Windows 7." It appears these 2 paragraphs are contradictory. Am I missing something? Thanks! EDITOR'S NOTE: No contradiction. In the case of the upgrade version, it needs to inspect your hard drive to verify that you have XP, which qualifies you for the cheaper upgrade edition. If found, it prompts you to format the disk and proceed with the Win7 installation. I'm running Win 7 RC on a computer and have a full set of applications installed, and when the release comes out, I'd like to install it in place of the RC. I own a Win XP Pro CD not installed anywhere, but am I right that I'll have to trash the Win 7 RC, install the XP, and then install the Win 7 upgrade? EDITOR'S NOTE: That's not clear to me. It would be NICE if we could just install the final version of Win 7 over top of the RC, but I can't find any confirmation that it will work that way. You mention under Dual Boot Setup that some Windows XP applications will not run under Windows 7. Do you have a list or article on what those applications may be? Thanks! According to this video on Microsoft technet, all you need is 30 minutes and Microsoft Deployment Toolkit 2010 Beta, In this video, Jeremy Chapman discusses the latest beta of the Microsoft Deployment Toolkit, specificallly the User State Migration Tool, to transfer the user settings and files from a Windowx XP installation to a new install of Windows 7 on the same PC. Reportedly, "one of the really cool features in this new version is hardlink migration. In the past, if you wanted to back up all of a users files and settings, those had to be transferred to a different drive, and the new OS install would wipe the machine, complete the new install, and then you'd transfer the files back. With hardlink migration, all the files stay in place on the machine, and the Win7 install just updates file locations with hardlinks. This means the install and settings transfer happens much faster, because the files aren't transferred at all, just the paths to them are updated. It's really cool, and means you can have a fresh install of Win7, with all your XP files and settings, completed in as few as 30 minutes." EDITOR'S NOTE: That's very cool, thanks. I wonder why this is not being publicized better? But it does seem there is a downside -- all the crud and malware will come along for the ride as well. So, it seems I have to buy and install a DVD drive just to install Win 7? That strikes me as unreasonable, as I have no other use for the DVD drive. EDITOR'S NOTE: No, that's not correct. See http://www.microsoft.com/windows/windows-7/get/installation-instructions.aspx -- it says "insert the installation disc into the computer's DVD or CD drive". You mentioned creating a partition and keeping XP and running Windows 7. Is it possible to put a second hard drive in your computer and put Windows 7 on it? EDITOR'S NOTE: Yes, that is essentially the same thing. You can have a dual boot system with two physical drives. I am running XP and have only one hard drive but it has several partitions, one of which is my c:/ where the operating system is. When Windows 7 reformats will it reformat my entire hard drive or just the c:/? EDITOR'S NOTE: Format works on a partition basis, so just the C: will be affected. If you are choosing the dual-boot route, please keep in mind that you should install anti virus/anti spyware software on _both_ partitions. Just because you have anti virus/anti spyware software installed on your Windows XP partition, does not mean that you are protected when surfing the Internet etc. while using software installed in your Windows 7 partition. I will be purchasing a new PC in the next couple of months. Will I have problems migrating my XP software to Windows 7? Would I be better off to buy a machine now with Vista, then migrate to Windows 7 (free upgrade with the machine purchase) when it comes out? EDITOR'S NOTE: The vast majority of XP software will run fine on WIn7. And the free Win7 upgrade on Vista machines is a good deal. There is one other alternative, if you don't mind shelling out a few bucks for a third party program. Laplink's PCmover will offer a more or less direct upgrade path from Windows XP to Windows 7. Details are on their website. I was even told that you could upgrade from 32 bit Windows XP to 64 bit Windows 7. A consideration for those who bought a 64 bit machine only to find it came with 32 Bit XP pre-installed. OR we could just stay with XP and save the hassle! Thanks for the tutorial. I did the install on a fresh partition and the everything worked swimmingly. The problem is that I cannot get back into my XP partition. When I reboot it doesn't give me the option to get back into XP, it just boots right into Win7. I can see that the XP partition is still there by looking at the drives on my computer in Win7, so I know I haven't deleted the partition. Any help would be greatly appreciated. I like the idea of keeping XP on a dual boot so that I wouldn't have to reinstall XP when I want to reinstall Windows 7. I'm wondering if I could use nLite to make XP just small enough to activate Windows 7. I saw an ad on the internet for a company that has written a program that will let you upgrade directly from Windows XP to Windows 7. Anyone know anything about this program? Since you have to reformat your hard drive, then you wouldn't need to reinstall XP, right Randy? I heard (not sure where from and can't find it again) that Win7 will ask for the WinXP CD to validate that it is an update. I have a Win 7 upgrade disk and XP already on one computer. This may be a dumb question, bot when you state in option 2 that XP must be running, does this mean that the computer should already be turned on when the Win 7 disk is put it or not? My XP is an educator's copy and due to a number of reformattings before replacing the computer, I have concerns about the key continuing to work if I mess this up. I am technologically paranoid about making mistakes I will regret later. I have Win XP Pro installed and am considering installing Win 7 Enterprise as a dual boot on my XP. I had seen on the Internet that intermittent problems, e.g., failing to boot up, could occur installing Win 7 on the same drive as Win XP. I noticed that you had done this on your laptop. Are you aware of any such problem(s)of installing Win 7 on same drive as XP? EDITOR'S NOTE: No, I can't see why it would cause a problem. If I format one hard drive on my computer as Windows 7, will it be able to see my second internal hard drive that was formatted under XP? I'm keeping all my media on the second drive, and want to import everything over once the first drive is upgraded to Windows 7.